Uh oh. I wish I hadn't seen this thread. There's one in Woonsockett, about 20mins away from my new house. From the website it reminds me of Ocean State Job Lot, or Building 19 (when they were still around). 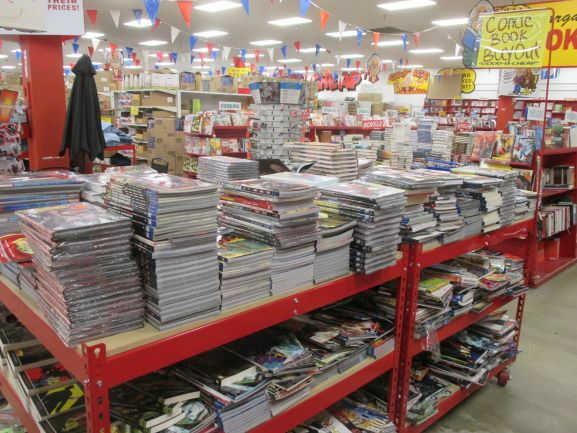 You are going to want to open up an Ollie's Rewards card. Buy something small the first time, because you get a coupon for 15% off everything after opening the card. Then go back and splurge with it. I went there today and there was an Ocean State Job Lot right across the street. Stopped by a local Ollie's last night to find a big table with a second shelf full of stuff. 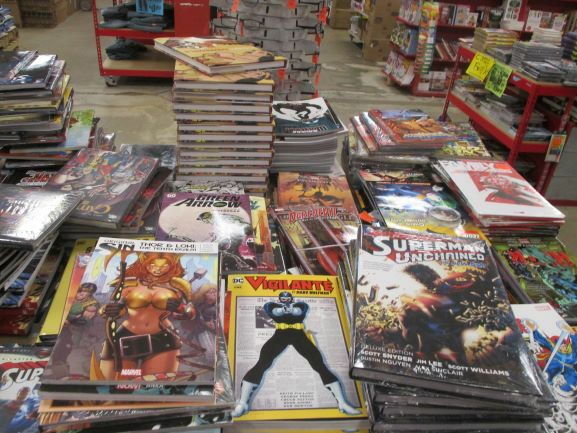 The problem is there was a boatload of piles all over the place across both shelves meaning you can't really look through everything unless you went to spend hours there. I ended up picking up the Original Sin OHC for 14.99 and the Galactus the Devourer TPB for 5.99 and might go back for more later. I know I occasionally get a mailer coupon, seems to be around certain holidays. Does anyone know when exactly they send them, and more specifically when the next one would be sent? They'll probably send one for Easter and another one for Mother's day. Usually they tie in coupons with holidays or military appreciation days. You can actually get your 15% off coupon your first visit. Just buy something small, sign up for their club and register on your phone. They email the coupon immediately. Then go nuts. I wish the two Ollie's near me had that layout for their trades. Both just stuff them into a 10' high shelf and the books are a bear to look through. That location seemingly put out their most recent comic palette all at once. Some stores won't have that much space and leave half the palette in a back stock room. That Superman Unchained Deluxe must not have sold very well. I almost feel like a sucker for buying it upon release. Wouldn't the 10' high book shelf be easier to look through if it has the spines sticking out? 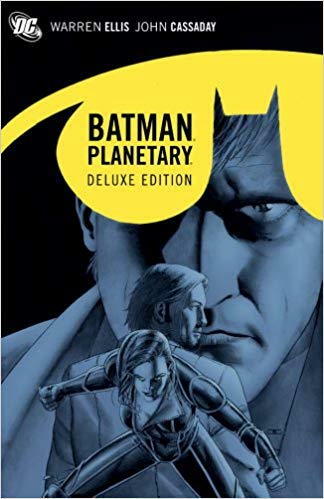 I don’t really see anything in those blurry photos I would pick up except for that Garth Ennis Demon TPB (even then, only if they had the first one, too) and maybe a Camelot 3000 HC. I went back to my localest Ollie's the other day because I got a 10% coupon in the mail (I guess it was from my rewards, I'm not really sure how the rewards work, I just always make sure to scan my card when I'm there). The layout was similar to sinned's pics except it was only 2 shelves not 3. 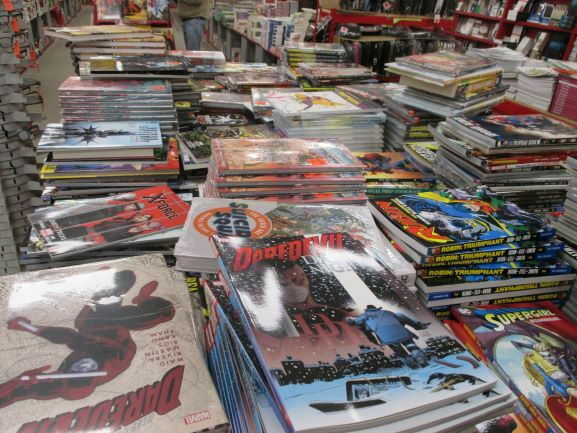 It's a nightmare to look through because the TPBs are just scattered all around in piles that usually contain more than one book. I probably looked around for half an hour and I'm sure I still didn't see every book. I do have another local Ollie's that I should stop and see if they have anything different. Man, I wish I had one of those stores here. Right off the top I'd be interested in the Vigilante book, and probably several others. We've got great weather, but lousy stores for stuff like that. You would think that is how they would lay them out, but both stores have covers facing the customer. It's a mess once a few people look through them and ends up in chaos after a couple of weeks. At my local one I had no patience to go through the shelves. From that photo it looks like others stores have a better selection. 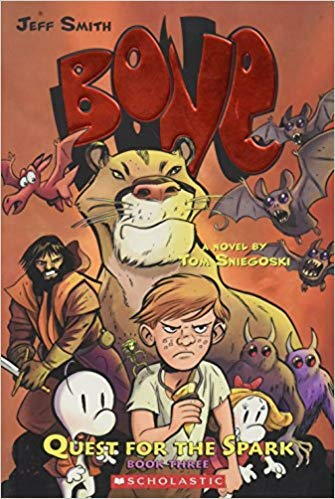 If they had that Demon TPB I would have bought it. I did see Trinity in hardcover though- tempting for $6, but I abstained. I have a few deluxe hardcovers I kept after my move last year but I sold the rest of my collection off. Books are nice but I have no real place to keep them. A new store nearby is having their grand opening this coming Wednesday. 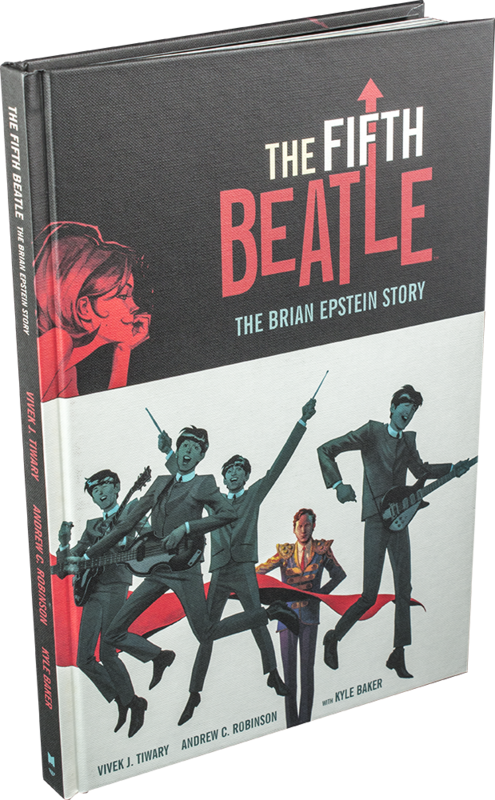 Hopefully, I will be able to check it out next weekend after trading my books with a local media store. I can't deal with Ollie's "organizational" methods. It's impossible to look through everything, and 1/3 of the inventory is way out of reach of anyone but Shaq. 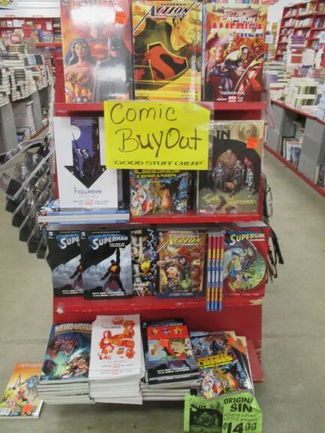 Ollie's definitely knows their comic trades have been a hit. They constantly advertise them in the weekly flyer as a legendary deal. The last 3 are all hardcovers. 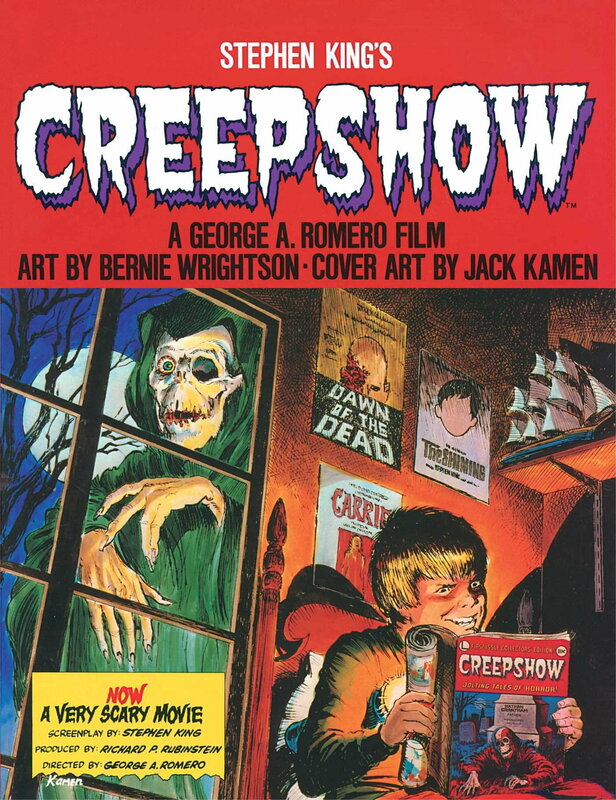 I'd love to find that Creepshow! I guess I'll have to look through the other books. 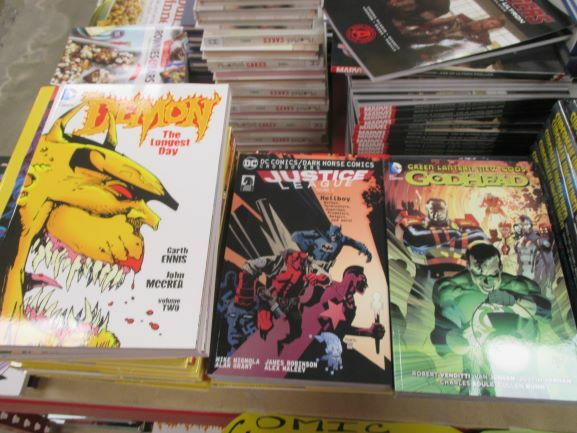 From my travels, those hardcovers are usually not included with the other comic trades. I've seen them land in the regular book section.